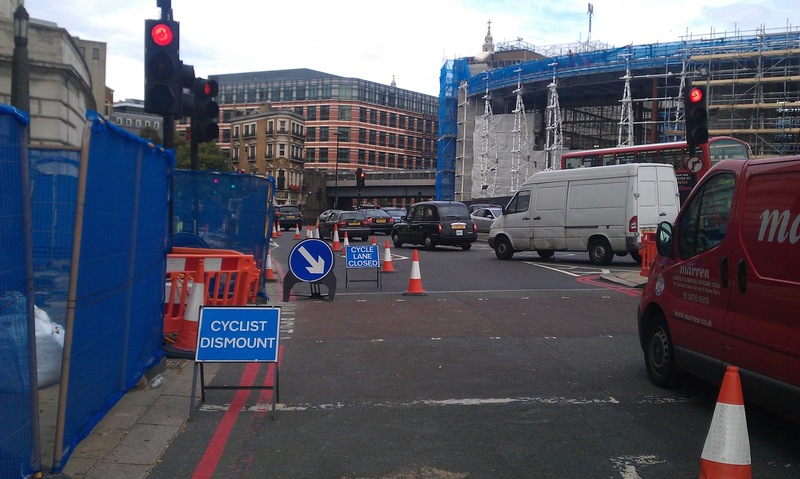 Cyclists in the City: TfL tells 36% of rush-hour traffic to dismount and walk at Blackfriars. Time we all got off our cycles and ambled slowly through the junction to prove a point. TfL tells 36% of rush-hour traffic to dismount and walk at Blackfriars. Time we all got off our cycles and ambled slowly through the junction to prove a point. Get off your cycle and walk. Blackfriars this morning. Some 36% of traffic passing this point at rush-hour consists of people on cycles. During the entire day, that's 16% of the total traffic volume. TfL's contractors are telling thousands and thousands of people who cycle here that they are supposed to stop, get off their bikes and walk. But where exactly are they supposed to walk with their cycles? There's about a metre between the hoarding and the side of the Lever Building pictured on the left in the picture above. And with the eastern side of the street closed that leaves a lot of pedestrians wanting to walk on that narrow bit of pavement in both directions. Even if you could access it, no room to walk with your cycle here. This one picture is jsut a tiny example of what's to come at Blackfriars. And a tiny sample of how I feel TfL and its contractors casually disregard people on its roads unless they are in motor vehicles. Put bluntly, what the hell are you supposed to do when you come to this sign? Are thousands of people supposed to stop in the middle of the road and walk their way through the junction? "Where access is permitted for motor vehicles, "Cyclist Dismount" signs should not be used. The hazards to cyclists at roadworks are rarely great enough to justify this measure. In any case, cyclists are likely to ignore such instructions." Maybe we should do exactly that just to prove that Transport for London hasn't a clue how to handle people on cycles on its roads. Jump off our cycles at the lights and walk slowly through the junction. So much for a transport authority that really thinks about how to handle people using its roads who just happen to be on cycles. Why can't you just ride with the traffic, as I would. Because it's specifically telling you not to ride with the traffic and that you should dismount. Even if most people will ignore it, the sheer presence of the sign is just wrong. Plain wrong. I'm enjoying the use of the singular - "Cyclist Dismount". Think this sign is descriptive rather than prescriptive - don't imagine more than one will bother. Scofflaws. What signage is there for cyclists approaching over the bridge? The white van in the picture appears to be right in the crappy advisory cycle lane which runs round this bend. Is the cycle bypass closed as well? Generally, if it is, I just kick away the signs and ride on through anyway. Of course the blue "Cyclist(s) Dismount" signs have no legal force - for that they need to be circular white signs with a red border - but I suppose they say "if you get hurt, it's not our problem". People should ignore them - it isn't going to make any difference to what TfL thinks or does anyway. "Cyclists Dismount signs should only be used as a last resort." From the photo, there is a lane coned off to protect, the wall that protects the public from the worksite... Have they put this wall in the wrong place? Certainly there's enough space to avoid disrupting cyclists. @Mark S, ndru I like that. Sticking up some signs to the effect of, "For the duration of these roadworks, this lane is reserved for bikes," would be stunning. Love to see the reactions of motorists being told they're second class commuters. I came through Blackfriars this morning, and in fact the thing which struck me most forcible is the way they have now rendered the Watergate pedestrian crossing virtually useless, but erecting loads of temporary fencing so you have to "stagger" some distance from one side to the other of the traffic island. It's as though they were making sure pedestrians get used to the imminent disappearance of that crossing! I was in Vienna this week and experienced superb conditions for cyclists during roadworks at the Westbahnhof. The pavement was being dug-up, so they diverted pedestrians out into the cycle track. The cyclists were diverted onto a lane of the motor-highway, which had been cordoned off for this purpose using large concrete blocks. The cars still enjoyed three lanes of their inner ring-road. In the UK the transport planners would simply shut the cycle-path as a matter of course and hope the cycling commuters, shoppers and school children etc. find an alternative mode of transport for the duration. I would love to see the cyclists in greater numbers to cross the bridge and make the vehicles to slow down. After all this is the direction we should be moving to more cylcists less cars in the city . This a sight I would love to see. My personal preference would be for "Cyclists Dismount" sign like these to be replaced with "Caution - Cyclists Merging" or even "Cyclists Proceeed with Caution" there's never a good reason for cyclists to dismount. Either they can merge with the foot traffic and travel at walking speed or the other vehicles can slow down and travel at cycling speed. I would have organised a group and all dismounted and walked in the middle of the road... pathetic.